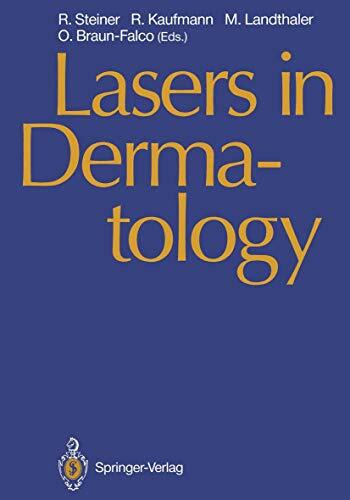 <b>Lasers in Dermatology</b> presents an excellent and complete survey of the numerous applications of lasers in dermatological therapy and research, the fundamentals of laser-skin interaction, and the various laser sources and tools in use. A comprehensive outlook to new instrumentation, such as pulsed lasers of ultraviolet and infrared wavelengths, completes this up-to-date overview, which is indispensable not only to practitioners and clinical researchers in dermatology but also to engineers and laser physicists in biomedicine. We ship by USPO exclusively. NO UPS. Our billing address is: ALLEN'S BOOKSHOP, P.O. Box 7264 Baltimore, MD 21218. Street address is: 416 East 31st Street, 2nd floor, Baltimore, MD 21218. E-Mail address: allensbookshop@rcn.com. Phone is (410) 243-4356. David S. Ray, Owner.